The Online News Association's annual conference Sept. 24 - 26 drew more than 2,000 attendees who wanted to learn about digital journalism. During a presentation by Wall Street Journal Executive Mobile Editor David Ho, audience members raised their phones to drive home the point about how ubiquitous smart phones are today. Photo by Kate Nash Cunningham. 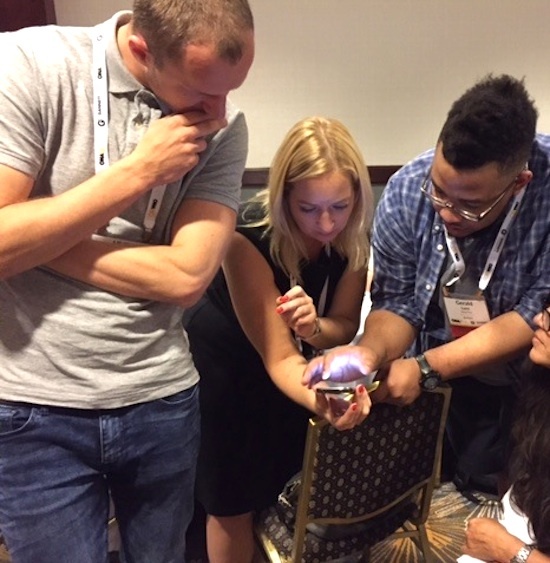 Journalism educators from around the country heard about virtual reality storytelling, robots in reporting and a slew of new social media apps at the Online News Association conference last weekend in Los Angeles. Demonstrations at the sold-out conference in Los Angeles included software that creates a geofence for targeted social search, sophisticated mapping software and hologram-creating machines. Much of the technology has applications for the newsroom and the classroom. But how can journalism educators begin to incorporate such new and expensive tools in their college curricula? Futurist Amy Webb, who wrote this piece on improving journalism schools, said educators can do a lot just by studying up on a variety of digital trends. “The biggest take away for educators is to broaden their sphere when it comes to digital media,” she said in an interview after delivering her 10 tech trends for journalists presentation at the conference. J-School professors also can experiment by adding little pieces of technology to existing or ongoing projects, Webb said. Students doing investigative reporting, for example, should incorporate online fact-checking while other students can get started with programs that mine photos for data, she said. 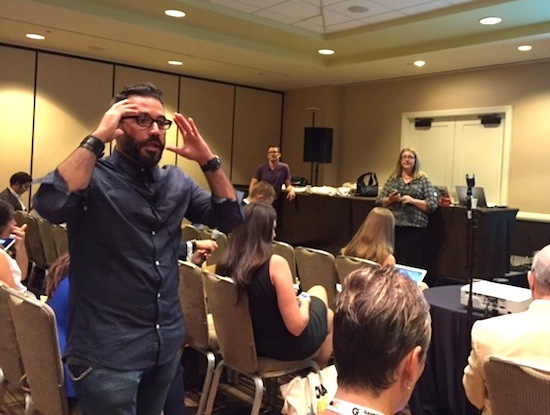 Robert Hernandez, associate professor of professional practice at the USC Annenberg School of Communication and Journalism, spoke about introducing digital media in the classroom during a panel for journalism educators at the Online News Association conference Sept. 24 – 26. Photo by Kate Nash Cunningham. Along with staying current on digital media trends, professors slowly can make themselves (and their students) more digital, said Robert Hernandez, associate professor of professional practice at the USC Annenberg School of Communication and Journalism. Hernandez said educators should work to train students on things like content management systems such as WordPress that are commonly used by news organizations. “In them creating a post and having them upload something into the media library, they are getting to use a content management system that the real world uses, not the classroom,” he said in an interview. Hernandez, who has taught classes using virtual and augmented reality, said professors also can take advantage of free and low-tech platforms for every class project they do, such as buying domain names and setting up Twitter, YouTube and Gmail accounts. During several panels throughout the event, other educators spoke about how they have incorporated tech and digital media in larger ways. Matt Waite, a professor of practice at the College of Journalism and Mass Communication at the University of Nebraska-Lincoln, said he has experimented around the edges of his department’s core classes. “What I have done is try to build things outside the core and not even in the building in some cases,” he said during a panel about building digital culture in journalism schools. Apart from incorporating tools like drones into his classes, Waite said he believes in giving students a space to experiment with digital tools and tech — things that often need space beyond the traditional physical classroom. He found a room that previously was used for still photography and turned it into a maker space where students can tinker for a few hours on Friday afternoons. Projects so far have included 9-foot kites with cameras attached. “It’s the idea of ‘hey, come on down, try something crazy … try something new, see if it sparks your passion,'” he said. At the School of Journalism and Mass Communication at Texas State University, associate professor Cindy Royal has introduced digital media into her program on a large scale, working to create a major in digital media innovation. Trying new things along with students is key, she said. Royal told other educators to not “be afraid to teach something you have never done.” At her school, she’s preparing for a class that uses sensors to collect data for storytelling. But even without maker spaces and sensors, journalism professors can open their App Store or Google Play and download, try and then show students a few apps discussed at the conference. One place to add digital media to the classroom is in multimedia courses where students have room to experiment with different platforms. Snapchat provides an easy way to create and share short stories in a space many students already are using. Using the “my story” function, journalists can piece together a slide show or video that will stay online for 24 hours. “Journalism students should definitely use Snapchat,” said Gerald Lane, a platforms producer for NowThis News, who gave a hands-on training for the app. So far, big news outlets like CNN and ESPN publish to Snapchat’s Discover section. But many smaller organizations and individual journalists not included in Discover publish their stories as well. NowThis has used it to cover international stories include Syrian refugees. Snapchat is free and available on iOS and Android. Uldis Abolins and Kristina Jackunaite, left, learn from Gerald Lane of NowThisNews, right, about how journalists can use Snapchat. The social media app was one of several discussed during panels at the Online News Association’s annual conference Sept. 24 – 26. Photo by Kate Nash Cunningham. Professors looking to teach students how to live stream events or create and distribute their own newscasts can have students download and try Periscope. This tool allows anyone with an internet connection to show the world what they see. This is a great tool for students on both sides of the camera to learn. In less than a minute and with a steady hand (or better yet, a tripod) students can be broadcasting live from the campus or local event. Because broadcasts can be saved, students can return to the classroom for critiques of their videos. Periscope, which is integrated with Twitter to spread the word about your broadcast, is free and available on iOs or Android. 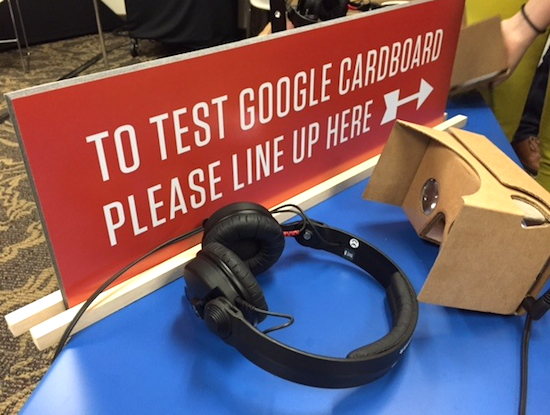 The virtual reality viewer Google Cardboard was a popular item in the Midway showcase area of the Online News Association’s annual conference Sept. 24 – 26. Cardboard works with an app to allow users to see 360 video. Photo by Kate Nash Cunningham. Virtual reality in a news context is coming. It’s actually already here. 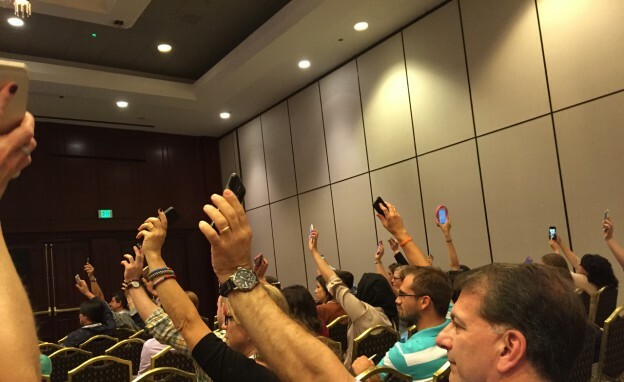 Several of the panels that drew large crowds at ONA focused on virtual reality storytelling and 360 video. But journalism professors don’t have to talk their department heads into buying the still-pricey Oculus Rift goggles. There’s a cheaper way. As journalists start to think about building narratives and story lines with 360 video, it’s key for students to become familiar with the technology used to view it. Cardboard does that, and a time when 360 video is poised to hit the masses, including during the upcoming Democratic debate hosted by CNN. Already, Facebook has announced it will support spherical video. Aaron Luber, head of partnerships with Google Cardboard, said now is the time to join the trend. “The launch of spherical video on Facebook … we’ve got spherical video on YouTube, a lot of people are just beginning to see and experience (it),” he said. The Cardboard app is free and available on iOs or Android. Kate Nash Cunningham is a journalism instructor at the University of New Mexico who spent almost 15 years as a print reporter. At UNM, she also works as the editor of the journalism collaboration lab @newmexiconewsport. She has a master’s degree in digital journalism and design from the University of South Florida St. Petersburg. Follow her @katenashnm.